Stay in Apulia's best hotels! Nicolaus Hotel offers stylish rooms, free Wi-Fi, and a fully equipped wellness area with indoor pool, gym, sauna, Turkish bath and hot tub. It is in Poggiofranco, a residential area of Bari. Everything was excellent! We found all the facilities we needed for our family trip. The staff was very friendly and highly proffessional. Money well spent! Located in Cerignola, Grieco Business & Spa Hotel has free WiFi. Featuring a 24-hour front desk, this property also provides guests with a restaurant. Easy to reach the hotel. Private parking. Nice facilities. Featuring a garden and terrace, Bianco Riccio Suite Hotel is located in Savelletri di Fasano, a 20-minute walk from Archaeological Museum Egnazia. The Bianco Riccio is an outstanding hotel: rooms are spacious, clean, and modern; staff is extremely friendly; breakfast was plentiful and delicious; and the views are breath-taking. Hotel Dei Cappuccini offers accommodations in San Giovanni Rotondo. Every room has a TV. You will find a kettle in the room. Each room comes with a private bathroom fitted with a bidet. Very friendly and clean. Easy to park. Very nice breakfast. 10 minute walk (with children) to Chiesa di Santa Maria delle Grazie. Hotel Executive Inn is located in Brindisi and it offers modern-style rooms and free WiFi throughout. A rich continental breakfast is provided daily in the shared dining area. the staff are friendly, specially Ms. Margarita and was super helpful with all everything we needed. Located just 5 minutes' walk from Fasano city center, Relais La Casa Del Balì is set in a historical building. The property offers a guest lounge and a terrace with an outdoor dining area. Franchsco was extremely helpful, friendly and polite. Offering air-conditioned rooms with free Wi-Fi in the very center of Foggia, Bella Napoli is a 10-minute walk from Foggia Train Station. It features a restaurant and fine wine list. We asked for a late check out of a half hour later. There check out is already later at noon. Set in the Porta Napoli district of Lecce, 8piuhotel is a 4-star design hotel offering a free fitness center and modern accommodations with high-technology devices and free WiFi. Very modern and well run hotel, very good breakfast easy to walk into Lecce old town. Beautifully set in Torre dell' Orso in Salento, and opposite a 16th-century ancient tower, Hotel Belvedere offers spacious rooms. The hotel features an outdoor swimming pool. Location was good. The rooms were very nice and clean for a beach town. Very quiet. Set in the historic center of Nardò, Il Mignano is set in a building that dates back to the Middle Ages. It offers a lounge and tea room, a traditional restaurant and free WiFi. The staff were very friendly and helpful. Set 2.5 mi from Lecce's historic center, this modern hotel offers elegant rooms with parquet floors, flat-screen TV and free Wi-Fi. The SS694 Ring Road is a 5-minute drive away. The breakfast was really good. Staff was very friendly and helpful. Set in the Puglia countryside, Tenuta Inagro is a modern 4-star hotel 0.6 mi outside San Severo. It features a contemporary lounge bar and café with wood floors and an elegant restaurant. One of the nights we decided to stay in and eat at the restaurant. The staff was amazing! Opened in 2010, Hotel Vittoria is in San Giovanni Rotondo center less than 5 minutes' walk from the Sanctuary of Padre Pio. It offers air-conditioned rooms and a buffet breakfast. Accommodations were very clean and comfortable. Great location and close to the Shrine. Just a 20-minute drive from Gallipoli and 12 mi from Lecce, Galatone's 3-star Hotel Ghalà offers free parking and rooms with attached bathroom with free Wi-Fi and an LCD TV with Sky channels. Great centre to get to see Salento but in a peaceful area. Mare Resort is an elegant, luxurious property a 5 minutes' walk from Trani's harbor. It is located in Palazzo Telesio, an 18th-century building with a top-floor terrace. Bike rental is free. Historic palace of Italian Duke, beautifully restored. Just a 15-minute drive from Otranto, Sanlu Hotel is in Serrano just off state road SP48. It offers free indoor parking, free Wi-Fi and brunch served until 12:00. 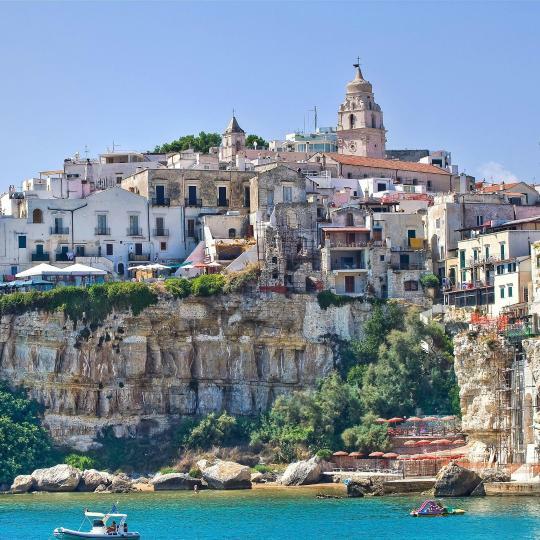 With crooked alleyways and narrow streets, Vieste's old town houses the Romanesque-style cathedral, the Swabian Castle and the chilling Chianca Amara monument. A stunning example of Romanesque architecture, the basilica hosts the relics of the city’s patron Saint Nicholas and is an important pilgrimage destination. 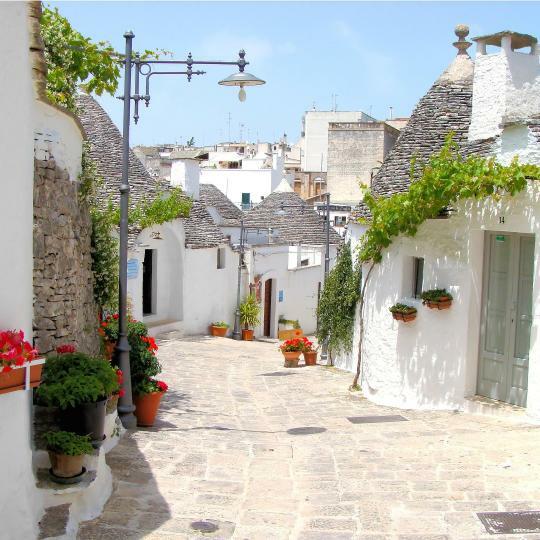 Pay a visit to the charming UNESCO-protected Trulli of Alberobello, unique buildings with conical roof which have become a very popular tourist attraction. 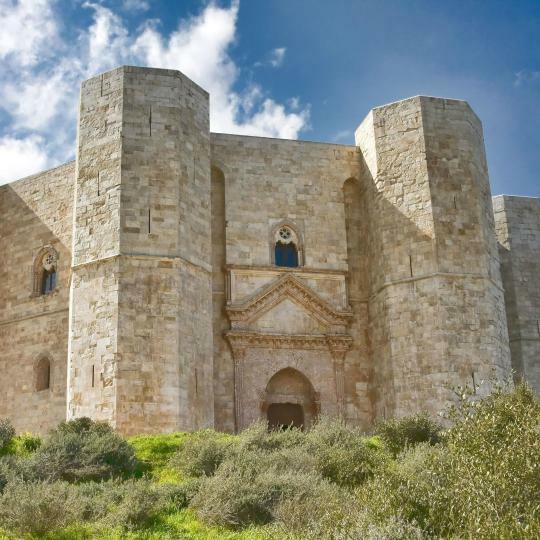 Enjoy a glass of Andria’s full-bodied wines and head to this famous 13th-century castle, featured in the design of the Italian one-cent coin. 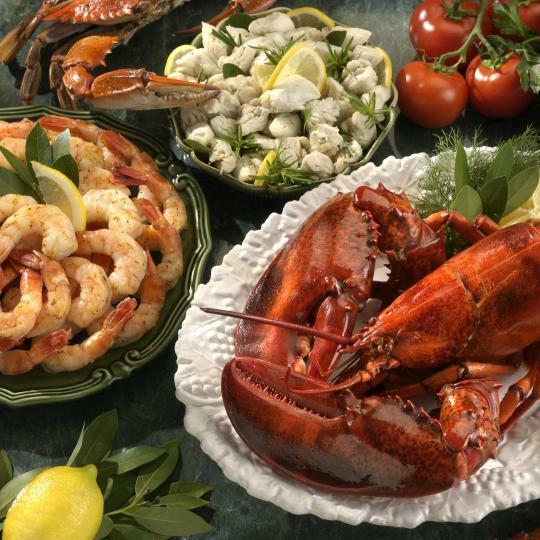 Whether you fancy fresh sea bass or fried octopus and calamari, there are plenty of seafood restaurants around Peschici to choose from. 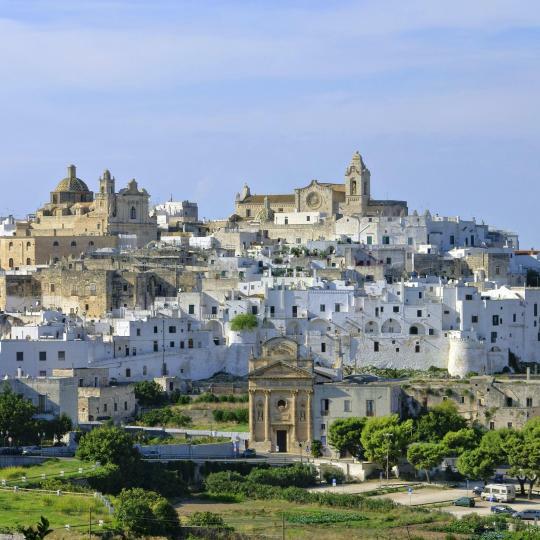 Majestic and beautiful, Ostuni is commonly known as the White City for its whitewashed houses. Don’t miss its charming Gothic-style cathedral. 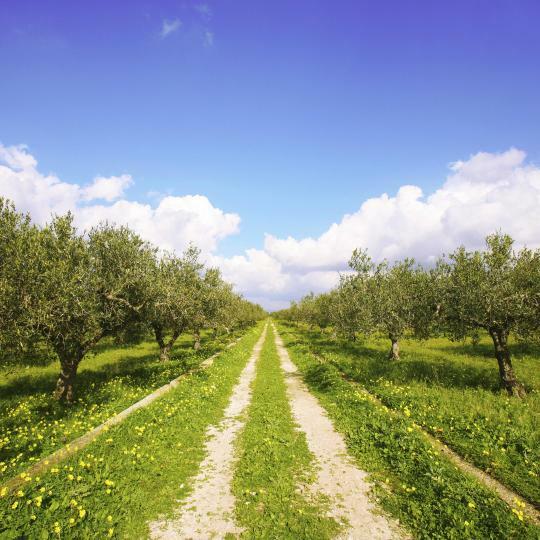 Masseria S. Angelo de' Graecis is a small museum dedicated to the origins of the production of olive oil in Puglia. 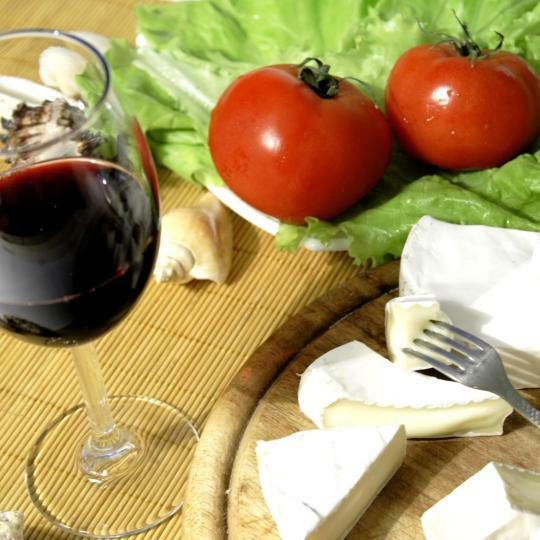 Rich burrata cheese and homemade orecchiette pasta are only some examples of the delicious food offered in any farmhouse in Puglia. This stunning park offers opportunities for hiking, unique flora and fauna, and great views of the beaches from a distance. 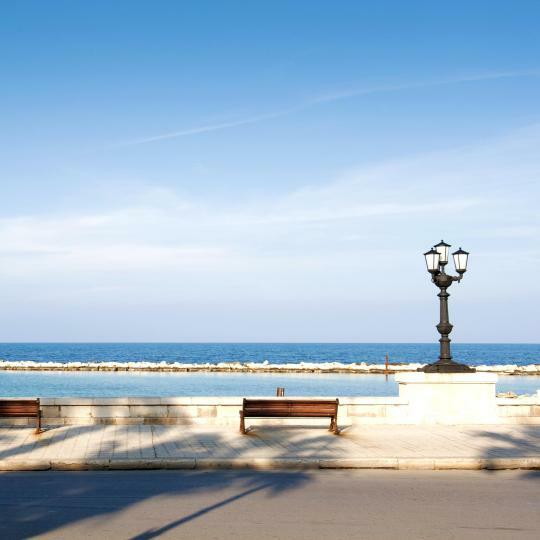 Get lost in the maze of narrow streets of Bari’s charming old town and take a relaxing walk along the beautiful seafront. Authentic vibrant town, my favorite in Apulia. Authentic vibrant town, my favorite in Apulia. Black and white is the best restaurant. 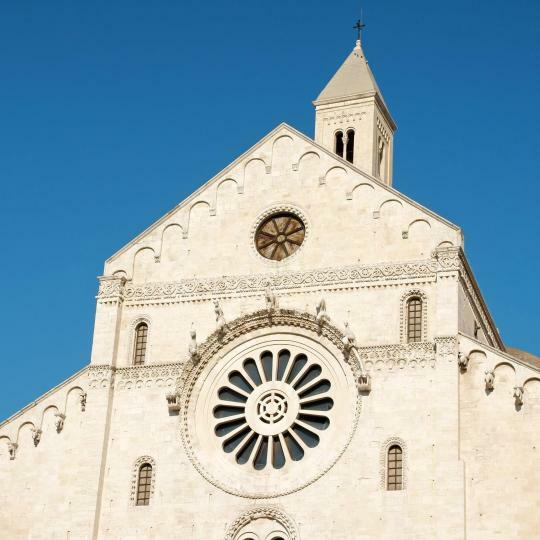 Bari is a large hectic city steeped in history as are all of the port cities in Apulia. Great place to review historical place all in a beautiful area. I really enjoyed taking walks . Beautiful apartment at the top floor in a classic building, with a gorgeous terrace and a cosy feel to it. The apartment is very close to the beautiful Barivecchia, and we parked the car nearby in a garage (the one in the Port, 4 EUR/day). Maria is an excellent host, communication with her before arrival was flawless, she is friendly, flexible and made us feel right at home! We even got to try her delicious Parmigiana, an Apulian traditional dish! We can't wait to return to her place! Very nice and clean place. Great breakfast made by Dani (He is one of the brothers that owns Apulia 70 Holidays). There are a couple of very nice beaches in Polignano. Vito (the other brother) can help you with anything related to the city and surroundings. They even got coupons that you can use at some local restaurants. Overall a very nice experience. Wonderful incredible outdoor space, out of a movie! The hosts are generous and helpful. Our two young boys loved the property, but also would be perfect for all adults. 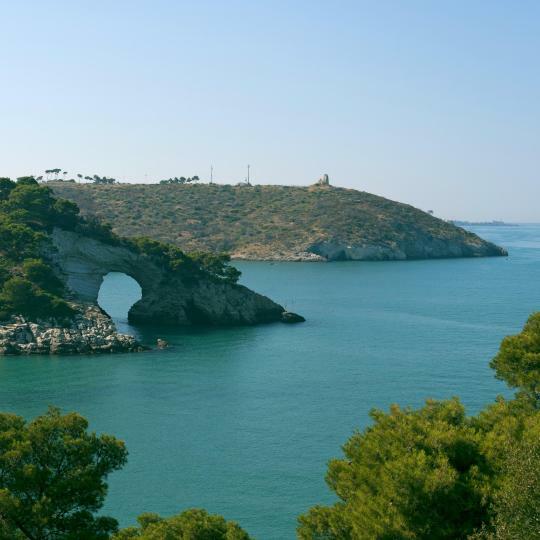 Close to many regions of Apulia for exploring but tucked away in a safe, beautiful scenic spot. The decor is incredibly perfect and the kitchen has all the necessities. Amazingly polite and welcoming staff. Very friendly and always with a smile. Extremely nice in giving us their recommendations. Beautiful little property in the Apulian countryside. It's my send time there and I would definitely go back. Excellent location near Bari Central Train Station, so you can visit all beautiful cities and villages across Apulia. And also super close to Old City of Bari. Agostino was very helpful a friendly. We enjoyed it very much. Speechless, amazing place and amazing hosts. The villa is situated in a sweet-spot position with amazing views, roads and trails. You should definitely check out this place if you are in Apulia. An excellent hotel that has all the conditions to relax. Breakfast is varied and quality: yogurt, milk, tea, coffee, salami, cheese, cereals, cakes, croissants, juices, and more. The room is large and beautiful with balcony. The pool is ok. Good food restaurants. And the garden is gorgeous! Great Staff- well-trained and truly friendly and buffet meals (yes, buffet selection and quality was excellent). Equipment for facilities, average. Nighttime entertainment, well done. Very nice location. Bungalow are very comfortable. Well equipped for families and children. An amazing, amazing location on a beautiful private beach, free kayaks to use, too. Beautiful facility. Great spa, gorgeous outside areas and private beach. This place was unbelievable for the price. Everything! What an amazing place! !